Hot Turkey for dinner on Sunday? The Turkish GP is on this weekend in the Istanbul “otodrom”, which as the old song went, “You can’t go back to Constantinople, ‘coz it’s Istanbul, not Constantinople”. 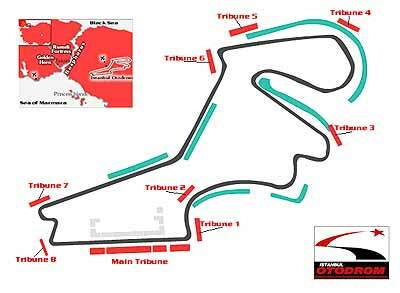 This is another circuit designed by Hermann Tilke, and everyone was amazed last year that it was very good, especially when there had been many reservations expressed before last year’s first ever GP in Turkey. Herr Herman can produce a good F1 track. Places for passing did occur and it is an interesting layout, with hills and hollows. Also of interest from last year was the fact that there appeared to be more than adequate run-off areas, with nobody hanging their cars on walls. The circuit is about 80 km east of Istanbul, and is 5.3 km long. The theoretical top speed should be around 320 kph. The race is over 58 laps and expect lap times down around 1 minute 24. Racing is anti-clockwise, and for much more than that you will have to watch the TV as I do. Renault will have the controversial dampers back in, I believe, and Alonso will be very keen to show that he is still the champion-elect, while Raikkonen will be out to make amends for running into Liuzzi in Hungary. Ferrari? Expect the unexpected, is my prediction! We will also see if Honda really has come in out of the cold. I personally doubt it, but we’ll know by Sunday evening. The GP should be at 7 p.m. Thai time, but as always, check your local feed to confirm this. I will be watching as usual from my perch at Jameson’s Irish Pub on Soi AR (next to Nova Park), and we watch the South African feed which has some decent commentators and no adverts! Join me for a meal and a natter first. Small cars are coming – government permitting! Some shilly-shallying by the government has resulted in many manufacturers sitting on their hands while waiting for the direction the government might move. So what could be waiting for us? Suzuki has the 1.5 liter Swift ready to go, plus other smaller engined cars, but is waiting. Kia has the Kia Rio which would sell for under 500,000 baht, GM has the Aveo and we are told it will be here soon, Toyota has a bunch of small vehicles to choose from, and even the Chinese are exporting to Malaysia with the Chery QQ, with its 812 cc, 52 bhp mini-car. But not to Thailand. Today’s consumer is concerned with price, which is one reason that pick-ups have sold so well in Thailand - the preferential tax structure has kept pick-up prices low, compared to sedans. In June, for example, 34,616 pick-ups went out the door, compared to 15,417 cars, but if you could buy a Honda Jazz or Toyota Yaris base model for the same price as a base model pick-up, you would soon see where the customer preference lies. I agree with Suzuki’s Yoshaiki Tamai, in that there has to be a strong government commitment, written in stone for the car companies to follow. Suzuki claim that start-up costs for production of small cars here would be in the vicinity of 3.8 billion baht, so you can understand why firm commitment is needed. But will a (or can a) caretaker government do that? I doubt it. For the time being at least, we are stuck with the lumbering (and expensive to run) pick-ups, rather than the smaller sedan cars which would be fuel efficient and use less road space. Let us see what happens after the October election! Honda are definitely attacking in the luxury car stakes, even if the F1 results are doubtful. 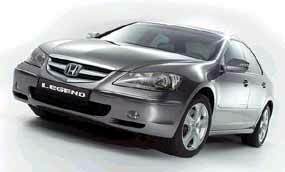 GoAuto in Australia have just finished testing the new Legend, saying that it is Honda’s most convincing and best-value luxury sedan yet. Priced from A$74,500 - which is almost A$12,000 lower than the unloved previous model, which was discontinued almost two years ago - the fourth-generation Legend will also become the most powerful Honda ever sold in Australia when it goes on sale from September 18. Driving all four wheels is a revised version of the 3.5 liter single-overhead cam 24-valve V6 found in the MDX 4WD wagon, delivering 217 kW (295 bhp) of power at 6200 rpm and 351 Nm of torque at 5000 rpm, as well as an average fuel consumption figure of 11.8 L/100 km. This lightweight 60 degree V6 features Honda’s VTEC variable valve timing, with a 4950 rpm changeover point for the 12 two-mode intake valve intake points. It meets Euro IV emissions compatibility, partly due to a new variable flow exhaust system fitted with a three-way catalytic converter. A drive-by-wire throttle system is also employed. The only gearbox on offer is a five-speed automatic with a Tiptronic-style sequential shift mechanism located adjacent to the gear lever’s ‘D’ slot, or via paddles on the steering wheel. Interestingly, Honda claims this transmission features the widest ratio spread of any five-speed automatic gearbox in its class, as well as a computer map to determine throttle position, vehicle speed and acceleration/deceleration factors. The Legend’s big headline-grabbing feature, however, is the Super Handling - All Wheel Drive (SH-AWD) system. A full-time set-up requiring no driver intervention for operation, it apportions a varying amount of drive according to whichever wheels need it most - front-to-back and side-to-side in the rear. SH-AWD also actively counteracts understeer and oversteer properties, aided by the standard stability control, traction control and ABS (with electronic brake-force distribution and brake assist), so it has the complete box of tricks. Honda says it wanted this Legend to compete with Europe’s best, so it devised an independent double-wishbone front and Accord Euro-based independent multi-link rear suspension system, but with detail alterations. Optimised with the SH-AWD set-up, it uses aluminium components to reduce unsprung weight and increase responses, traction and handling over a wide number of likely road surfaces. The rack-and-pinion steering is electronically controlled and speed-sensitive, while the 320 mm ventilated front rotors with four-piston callipers, and 310 mm ventilated rear discs with large single-piston callipers, form a four-wheel disc brake system designed to surpass rival vehicles from BMW, Mercedes-Benz and Audi. Available only as a four-door sedan, the pronounced wedge-shape and underbody aerofoils make for better aerodynamics than before (0.29 is the drag co-efficient), while the body is 40 mm shorter, 20 mm higher and 25 mm wider than the old Legend. However, it looks more than just a little plain to my eye. To help contain weight, the larger body members are made of high-tensile steel, while aluminium is utilized in the bumper beams, subframes, bonnet, boot and suspension arms. Correspondingly, body stiffness rises by one-third. Honda expects a five-star NCAP crash-test rating (not yet performed), while the body structure was devised with SUV or light truck side-impact protection in mind. Other Legend body improvements include a new “ultra high gloss” paint method, doors that open a wider 80 degrees, 5 mm thick power window glass, and a boot lid with hidden hinges. Other interesting features include a novel “active noise cancellation” system that reduces low frequency exhaust noises from entering the cabin by using a counteracting audio signal through the door speakers and subwoofer located on the rear parcel shelf. Included in the package are dual-front, side and curtain airbag protection, leather upholstery, bona fide wood veneer (wot, no plastic? ), electric front seats (with heating and memory functions), high-intensity discharge headlights, cornering headlights, rain-sensing windscreen wipers, a sunroof, side and electric-rear sun blinds, a reversing camera, dual-zone climate control air-conditioning, ambient cabin lighting and two programmable keys that automatically set the seats, mirrors and wheel (among other things) to individual preferences. Wheels are 17x8 inch alloys shod with 235/50 R17 100W-rated tyres, while the spare is a stylized alloy space-saver. Most rivals are either smaller or significantly more expensive when matched for specification. They include the BMW 3 and (lower-end) 5 Series, Lexus IS250 and GS300, Mercedes-Benz C and E-class and Audi A4 and A6. Honda claims its new “Super Handling” all-wheel drive system, based on the set-up first utilized in the current MDX in the early 2000s, has a number of world-first applications. In gentle driving situations around 70 percent of torque is transmitted to the front wheels, full throttle acceleration drops this to 60 percent, while hard cornering sends up to 70 percent rearwards, with all of this available to the outside rear wheel if necessary to correct an understeer situation. Unique among other AWD vehicles, SH-AWD also increases the rotation speed of this outside rear wheel during hard cornering for more effective turning power, reduced understeer, better handling balance and greater cornering grip. Honda claims the upshot of this is class leading cornering precision and traction, since the slower-turning front wheels enable the SH-AWD system to use the engine power to yaw the vehicle while turning, counterbalancing and controlling the normally ensuing understeer. The SH-AWD’s physical properties consist mainly of a torque transfer unit bolted to the front-mounted transaxle. Providing it with input torque is a helical gear attached to the front wheel differential’s ring gear, which turn a propeller shaft 90 degrees and move it to the vehicle’s center line, with a composite propeller shaft then carrying power to the rear-drive unit. This contains three planetary gear and clutch sets, with the first driving an electromagnetic clutch for each rear wheel. It can alter between 30 and 70 percent of the engine’s total torque output depending on conditions, as well as increase the output shaft speed by up to five percent faster than the input shaft via a compact planetary gear set. Meanwhile, a limited-slip differential function is provided by the other two planetary gear and clutch sets. They control the amount of torque that reaches each rear wheel, from zero to 100 percent, thus creating the yaw moment under deceleration to stabilize the car. While all this sounds wonderful, I wonder if it will be like the Honda 4 wheel steer of a couple of decades ago, which came out on the Accord with a similar fanfare of trumpets, but has been quietly forgotten about since then. Last week I mentioned that in the formulae for racing cars in 1906 and 1908, both stipulated weight regulations. The weights were almost the same (1000 kg and 1100 kg), but what was totally different? In 1906 it was a maximum weight, while in 1908 it was a minimum weight. So to this week. A transverse engined V4 front wheel drive GP car ran in 1907. What was it?